Aside from uptime, website performance is something we talk a lot about here at Pingdom. There are lots of ways to improve the speed of your website, but this post will focus on ways to optimize the size and number of files your website uses, both being important factors affecting the load time. Since images usually make up most of the size of a website, we will focus the majority of this article on image optimization. The information we present below may be somewhat basic, especially if you are an experienced Web developer, but it should provide a good starting point before you turn to more advanced optimization methods. Images often make up the biggest part of what a user has to download for a website, although this of course depends on what type of website it is and how graphics intense it is. You will have to balance the size and quality (and quantity) of your images vs. load time. Use quality tools: To make things easier for you when you work with images, we really recommend that you use high-quality software such as Photoshop or ImageReady. There are also several very capable free alternatives available. Preview and experiment: When optimizing images, it really helps if your application has a preview panel when saving files so you can see the final result and test different formats and settings. For example, in Photoshop you should always use the “Save for Web” option (not “Save as”) since you will then be able to preview images properly as well as get the images compressed more efficiently. Use fewer images: For keeping the load time down you should try to use as few images as possible since each image adds to the overall load time. One technique is using CSS Sprites which means that you combine several images into one, which is then used through CSS. You can read more about CSS sprites at A List Apart. Pick the right image format: One of the most important things is selecting the right image format depending on the image contents. 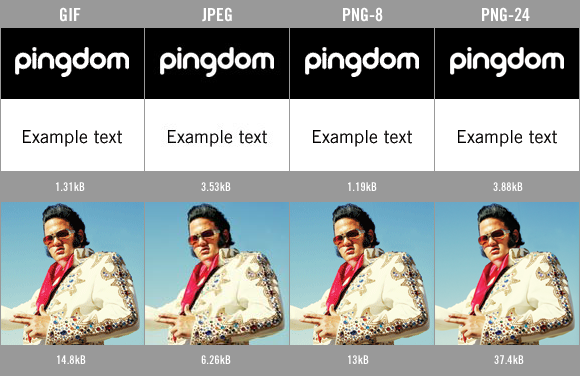 Below is a short explanation of the three major image formats that are used on the web. In fact, this last point is so important that we will give it a whole section, starting right here below. When authoring for the Web, picking the right image format can make all the difference. Most people know that the common formats are JPEG, GIF and PNG, but fewer know how to use them efficiently. The GIF format is limited to 256 colors and shouldn’t be used for photos. Today PNG is often a better alternative than using GIF. If you use GIF you should try to reduce the colors as much as possible while still making sure the image looks good. GIF is your only option if you need to have animation but don’t want to use Flash, etc. GIF can also contain transparency which is fully compatible with all older web browsers (unlike PNG). The PNG format was created as a replacement for GIF and is usually a better alternative these days. The only issue with PNG has been support for transparency in various browsers, but there are tricks to overcome this. PNG has support for both 8- and 24-bit images. 8-bit images can have 256 colors and is a good alternative to GIF while 24-bit can have millions of colors and is mainly intended for photos. Although photos can be made smaller in size using JPEG, PNG has the advantage that it is a non-destructive format, i.e. it will not alter or reduce the quality of the original image. Use PNG if you have images with few colors. Save as 8-bit. Use PNG if you have images that need to be identical to the original, with no compression artifacts. Save as 24-bit if the image has more than 256 colors. PNG is your only alternative if you need to have alpha transparency (partial transparency), but keep in mind that not all browsers support this. Tip: PNG images include a color profile which Internet Explorer treats differently than other browsers. This means that a specific color in your image will not look the same as the same color on your webpage, for example if you have a background image and a background color set in CSS. You can fix this by stripping out the profile from the image. PNGGauntlet can do this. The JPEG format is great for compressing photos, although the format is destructive so if you compress too much the image will not look good. Make sure that you save the original of the image because each time you save a JPEG it loses quality. Don’t use JPEG for text or illustrations since you will get blocky areas. JPEG is best for compressing photos to small sizes. Again, this image is saved in PNG-24 format because we need to show the original picture exactly as it was, without any compression artifacts. Avoid using CSS inside your HTML document as much as possible. Try to put your CSS in one separate file instead of several to reduce the number of files that need to be downloaded. To further reduce the size of your CSS you can “minify” it using a script that removes unnecessary characters. One example is Minify. To further reduce the size of your HTML you can use a HTML compressor to make it smaller. When working with the files related to your website, always think of the big picture (no pun intended) and keep in mind that every file will add overhead. The tips covered in this post are not very advanced or new, but hopefully they brought something to your attention even if you already have some experience creating websites. If nothing else, sometimes it can be good to take a step back and remind yourself of the basics. If you are using a WordPress or similar CMS website you can optimize your template by merging .php files. index.php simply calls other smaller .php files like header, sidebar, footer, to build the template up. Also you can reduce plugin usage to reduce further php calls. Good write up.. I personally use firebug with yslow and googlespeed. It will help you with everything mentioned above.